In its twelfth round of grant-making in the fall of 2018, the Q2C Land Conservation Grants Program awarded grants totaling $45,000 to six projects that will conserve a total of approximately 2,498 acres of land. 91 percent of the acres protected are located within areas identified as conservation priorities in the Q2C land conservation plan – falling within either “conservation focus areas” ranked as the most ecologically critical lands in the region, or “supporting landscapes” that buffer and connect the core focus areas. The total value of the projects funded in 2018 (land and easement value plus transaction and other costs) is conservatively estimated at nearly $2 million. The projects are briefly summarized below. The two-state Quabbin-to-Cardigan region spans one hundred miles from the Quabbin Reservoir in Massachusetts northward along the western spine of New Hampshire to the boundary of the White Mountain National Forest. Encompassing approximately two million acres, the region is one of the largest remaining areas of intact forest in central New England and is a key headwater of both the Merrimack and Connecticut Rivers. The Quabbin-to-Cardigan Partnership (Q2C) today released a request for applications for both its Land Conservation Grant and Trail Grant programs. In 2018, the Partnership has $45,000 for its Land Conservation Grant program and $50,000 for its Trail grant program to re-grant. The grant program is privately funded and administered by the Society for the Protection of New Hampshire Forests on behalf of the Quabbin-to-Cardigan Partnership. Non-profit land trusts, municipalities, and state agencies that have land conservation as a primary function are all eligible to apply for Q2C grants. The two-state Quabbin-to-Cardigan region spans one hundred miles from the Quabbin Reservoir in Massachusetts northward along the spine of New Hampshire to the southern boundary of the White Mountain National Forest. Encompassing approximately two million acres, the region is one of the largest remaining areas of intact, interconnected, and ecologically significant forest in central New England and is a key headwater of both the Merrimack and Connecticut Rivers. Launched in 2003, the Quabbin-to-Cardigan Partnership is a collaborative effort of more than twenty private organizations and public agencies working on land conservation in the Q2C landscape. The partners share a vision of conserving (on a strictly willing-seller/donor basis) the region’s most ecologically significant forests and key connections between them for wildlife passage and human recreation. Over the past ten years, the Q2C partners have helped to permanently protect thousands of acres. In its eleventh round of grant-making in the fall of 2017, the Q2C Land Conservation Grants Program awarded grants totaling $30,000 to five projects that will conserve a total of approximately 3,234 acres of land. 91 percent of the acres protected are located within areas identified as conservation priorities in the Q2C land conservation plan – falling within either “conservation focus areas” ranked as the most ecologically critical lands in the region, or “supporting landscapes” that buffer and connect the core focus areas. The total value of the projects funded in 2017 (land and easement value plus transaction and other costs) is conservatively estimated at over $3 million. The projects are briefly summarized below. The Quabbin-to-Cardigan Partnership (Q2C) today released a request for proposals for its eleventh round of Land Conservation Grants, which funds transaction-related expenses on land conservation projects in the “Quabbin-to-Cardigan” region of western New Hampshire and north central Massachusetts. The Q2C Partnership has $30,000 to re-grant in 2017. The grant program is privately funded and administered by the Society for the Protection of New Hampshire Forests on behalf of the Quabbin-to-Cardigan Partnership. Non-profit land trusts, municipalities, and state agencies that have land conservation as a primary function are all eligible to apply for a Q2C land conservation grant. In 2014, Ausbon Sargent closed on conservation easements in Goshen, Wilmot and Danbury with the help of Quabbin-to-Cardigan Partnership funding. The 51-acre Jillette Conservation Easement is located in Goshen with over 815 feet of frontage on the east side of Brickyard Road. Landowner, Bea Jillette, manages the property for timber production and her large field, with its beautiful views of the surrounding mountains, is maintained by a local farmer for hay production. The property is highly rated for wildlife habitat and highly ranked forestry soils and is very close to over 17,000 acres of contiguous conservation land. 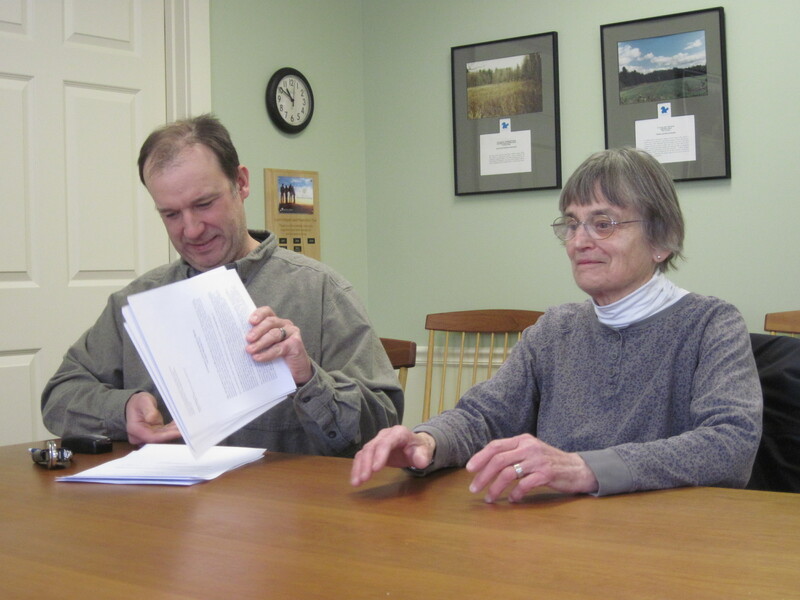 Paul and Jan Sahler placed a conservation easement on 21 acres of their 23.4-acre property in Wilmot, NH. This property includes a maintained logging road that extends back to Cascade Brook. This and some additional side trails now provide opportunities for outdoor recreation and for observing many forms of wildlife.Their property is adjacent to or near over 3,918 acres of other conserved land nearby. The 159.2-acre LeBaron-Brewer Property was also conserved in Danbury, NH in 2014. This property includes two-thirds of Severence Hill in Danbury with over ½ mile of shore frontage on Waukeena Lake. The property protects important wildlife habitat for the loons on Waukeena Lake and abundant moose. Click below for more information on Ausbon Sargent Land Preservation Trust and the above conservation lands. Photos courtesy Ausbon Sargent. Top photo – LeBaron-Brewer Property. The Society for the Protection of N.H. Forests (Forest Society) and the Washington Conservation Commission have conserved a 245-acre forest above Millen Lake in Washington. Click below to read the full story. Photo courtesy the Forest Society. The day the crew finished their largest staircase, they felt so proud of the work that they accomplished. Looking back at what had to be done on the first day, they all got a little glazed over in the eyes and could not grasp the scope of the project. As they worked day after day on the project and got to see it come together, it was easy to sense the ownership they were taking over it. Many of the crew members started to want everything done not only well, but well to the point where it would last forever. They wanted their stone staircase to be a sort of legacy they left behind. When they finally did finish the staircase and had the chance to take pictures with it, there was nothing but joy and pride to be seen on their faces. 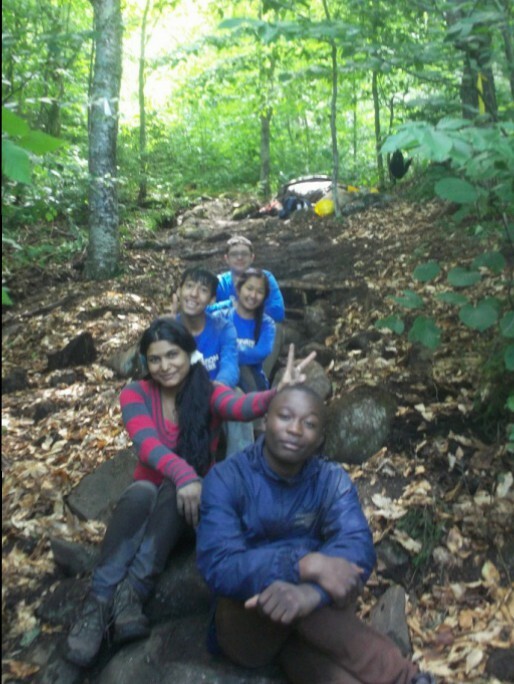 In July 2014, two crews of 5-6 high school youth from Manchester, NH completed trail work projects on Mount Kearsarge and near Mount Sunapee. The students met a variety of challenges on the trail, but accomplished a great deal toward improving public trails. The two separate projects were completed with the Sunapee-Ragged-Kearsarge Greenway Coalition and the Monadnock-Sunapee Greenway Trail Club and funded in part with Q2C Partnership. Click below to read the full stories. Photos courtesy the SCA NH Corps.